Firefighters face danger at every turn! After all, their entire job involves rushing into the thick of dangerous fires in order to save lives. They rush into burning buildings, they climb stories into the sky to rescue citizens in danger, and they occasionally save a cat or two from a tree. That’s why they wear protective gear from head to toe—that fancy hat that they wear isn’t just for show! Of course, if you plan on dressing up like a firefighter this year, then you’re going to want to craft a fully prepared look! That means you’d better be packing one of those sturdy looking helmets with your outfit! This deluxe red fireman helmet is a simple addition to any firefighter costume. It’s made out of molded plastic and is shaped into the signature shape of the classic headgear of firefighters. The front has a silver badge made out of molded plastic. It also has foam padding on the interior to facilitate a comfortable fit. Note: this is a costume accessory and it’s not intended to be used for protection purposes. 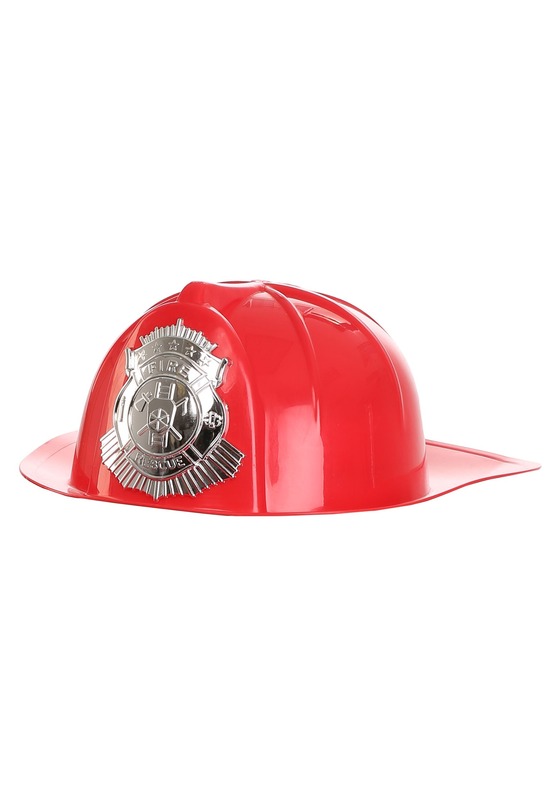 Just pair this helmet with any of our classic fire fighter costumes and you’ll have an authentic look!